Kit includes 14 Ct. White Aida, floss, pattern, needle and instructions. 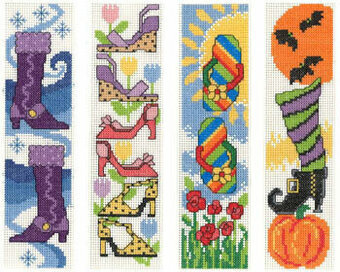 Finished size is 2.4" x 8"
Bookmark Medley presents 14 charming cross stitch designs to mark your spot in your favorite books! From owls, chickadees, and cats to lighthouses, flowers, wine bottles, and coffee mugs, you'll find just the right design in this collection. The designs are so quick to stitch that you'll have time to make some for yourself and all the book lovers in your life. 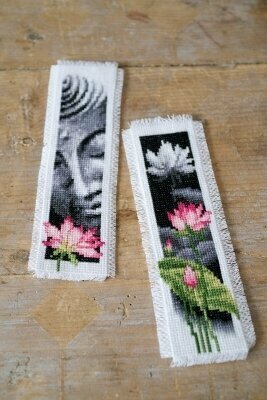 All bookmarks are stitched on 14 count White Aida with DMC floss. Owl bookmarks (DMC 434, 436, 437, 469, 470, 739, 746, 918, 921, 3371, 3820, 3821, 3822). Stitch count is 27W x 102H. Chickadee bookmarks (DMC White, Ecru, 310, 319, 320, 367, 368, 415, 727, 744, 745, 775, 797, 798, 799, 820, 828, 838, 840, 844, 3024, 3325, 3840, 3864). Stitch count is 27W x 102H. Wine bookmarks (DMC 315, 469, 470, 746, 3024, 3348, 3685, 3820, 3821, 3822). Stitch count is 30W x 118H. Coffee bookmarks (DMC 347, 434, 436, 437, 739, 746, 816, 3371). Stitch count is 27W x 102H. 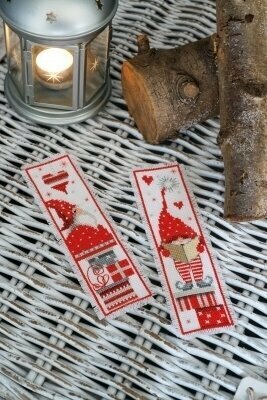 Lighthouse bookmarks (DMC White, 310, 321, 413, 415, 469, 666, 807, 3777, 3830). Stitch count is 27W x 102H. 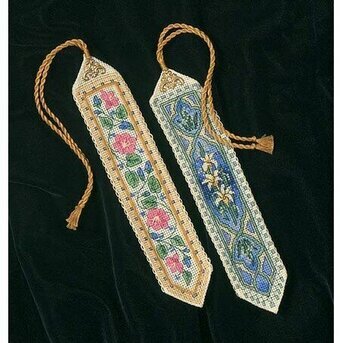 Rose bookmarks (DMC White, 319, 320, 368, 742, 743, 745, 775, 813, 818, 826, 899, 3326, 3371). Stitch count is 27W x 102H. Cat bookmarks (DMC White, 415, 434, 436, 437, 470, 739, 3371, 3820, 3847). Stitch count is 27W x 102H. Complete kit includes 14 Ct. White aida, pattern, thread, needle and instructions. Finished size: 2.4" x 8" each. Kit includes 14 Ct. White Aida, floss, pattern, needle and instructions. 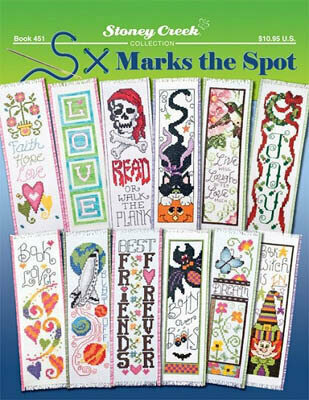 Finished size is 1.6" x 4.4"
Make beautiful bookmarks with this fun kit! This package contains eight 4 3/4" x 2" pre-punched bookmarks in three colors, pre-cut bakers twine, three designs and one instruction booklet. Floss NOT included. 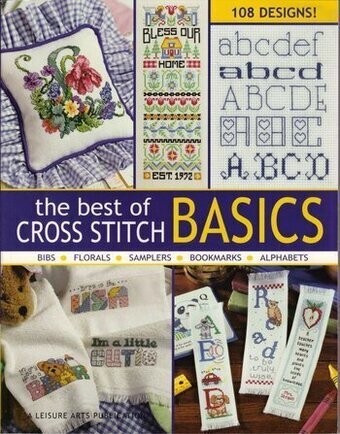 This book offers a big collection of the most popular kinds of cross stitch projects -- those great basic projects and designs that never go out of style, such as alphabets, bibs, samplers, bookmarks, and floral designs, just to name a few. It's the perfect resource for quick projects and gifts. And with a variety of designers to choose from (Deborah Lambein, Paula Vaughan, Polly Carbonari, Donna Giampa, Carol Emmer, Lynn Busa, Lorri Birmingham, and many more), you are sure to find the ideal design to inspire you. Winter, spring, summer and fall--there's a wonderful bookmark here for all! 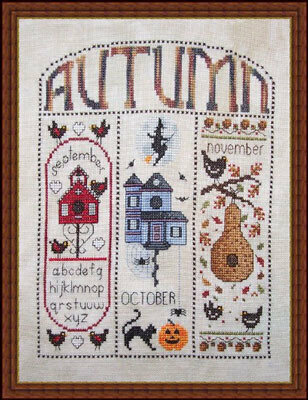 Designer Deborah Lambein has created 8 cross stitch designs featuring favorite symbols of the seasons, from spring bunnies and summer skies to fall harvests and winter snowflakes. 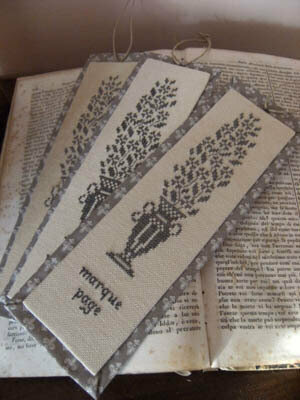 Each is stitched on a prefinished white Stitch-N-Mark (TM) bookmark made of 18 count Aida. Model stitched on 28 Ct. Legacy Cashel Linen from Picture This Plus with DMC floss and Threadworx. Stitch Count: 103W x 127H. 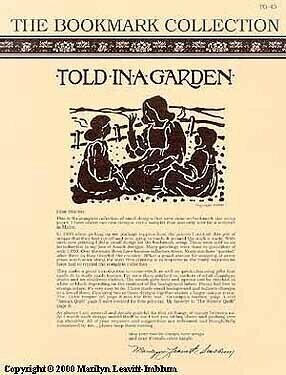 Package contains charting for the sampler, stitching instructions, and complete finishing instructions/ideas for four styles of bookmarks. Designed by Belinda Karls-Nace. Models are stitched on 40 Ct. Navy Bean hand dyed linen from Lakeside Linens with Weeks Dye Works . DMC conversions provided as 803 826 3832 435 898 3821 890 986 777 3835 white 924 948. 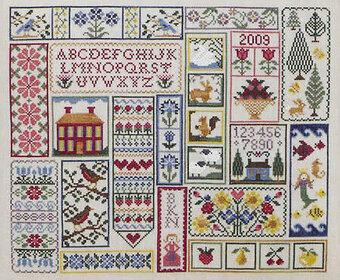 Sampler stitch count: 176H x 205W. Model is stitched on 14 count Perforated Paper using DMC floss. Stitch count: 27W x 102H. Featuring whimsical sayings for cat lovers including "If I Promise to Miss You, Will You Go Away?" stitch count 74x96, "Don't Mess With a Senior Citizen" stitch count 70x78, "Fat Cat" stitch count 89x88 , and more. 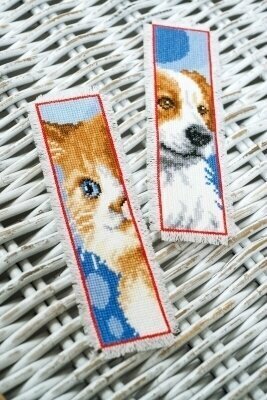 Cat bookmarks include Cat Tale, Litter-ature & Gray Cat all designed to stitch on an 18 ct bookmark. Hear no evil stitch count 83x36. Orange Kitten stitch count 42x80. Music Cat stitch count 159x99. I love cats stitch count 165x75. 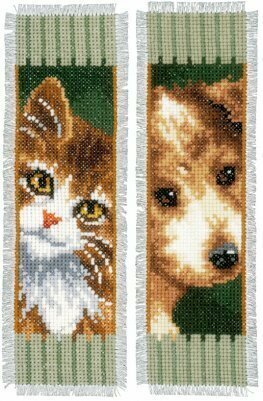 Walking cats and Creature Comforts are stitched on a towel or pillow sham. Stitch count 159x15 & 66x40. Out on a limb stitch count 92x105. Siamese cat stitch count 56x70. 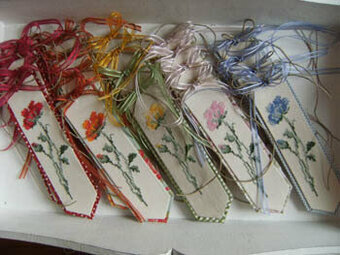 Very popular collection of small Amish designs that are perfect for bookmarks. Also includes a larger sampler. "The History of Chocolate. Love Story". Artwork by Randal Spangler. Model stitched over one thread on 25 ct fabric with DMC floss. Stitch Count: 62W x 349H. Exquisite counted cross-stitch designs with fine detail and realistic shading that capture the beauty of life. Kits include: 14 Ct Aida fabric, pre-sorted cotton embroidery floss, color-coded floss separators, chart and trilingual instructions. Packed in a durable, acetate project storage sleeve. Size: 2-1/2" x 8". Design Size: Set of 12. Model stitched on fabric of your choice with any one color of thread. Stitch Count: 19x106. Models stitched on 32 Ct Antique white Lugana using DMC floss. Stitch count 26x84 each.